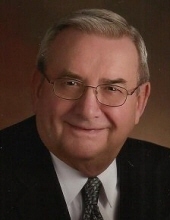 Edmund A. Mikalofsky, age 84, of Fond du Lac, died Friday, April 12, 2019, at Adelaide Place. He was born on August 3, 1934, in Sheboygan, the son of Edmund and Dorothy (Zufelt) Mikalofsky. Ed served in ROTC, Active Duty and Army Reserves. On May 13, 1959, he married Grace Schnell at SS Peter and Paul Catholic Church by Ed’s uncle Fr. H.J. Mikalofsky. Ed attended Campion Jesuit High School and graduated from Central High School in Sheboygan and UW-Madison School of Pharmacy. He was employed by the local pharmacies for fifty years. Ed enjoyed playing golf and reading. He was a member of Knights of Columbus #664, Fond du Lac Noon Rotary, and Holy Family Parish and was involved over the years at St. Mary’s Church as Communion Distributor, Lector, Religious Ed Teacher, Cub Master and past Parish Council President. Ed really enjoyed his family, especially grandchildren, getting together with the men Tuesday AM for Mass followed by breakfast. Survivors include his wife, Grace of Fond du Lac; children, Philip (Juli), Paul (Jenifer), Mary Beth (Brian) Pritzl, David (Karen), Julie Ann (John) Karner, Amy, Angela (Steve) Westerhouse; grandchildren, Andrew, Lindsay, Geoffrey, Rajeev, Bhanupriya, Nikki, Darien, Erik, Nya, Sonja, Benjamin, and Everett; brother-in-law, James (Margie) Schnell; sisters-in-law, Gladys Paulson and Louise Thiel; his companion lapdog, Zoe; and other relatives and friends. He was preceded in death by his parents; and his sister and her husband, Ann (Alfred) Bodden. Visitation will take place on Monday, April 22, 2019, from 9:30 AM until 11:00 AM at Holy Family Church, 271 4th St. Way, Fond du Lac, WI, 54935. A Mass of Christian Burial will follow the visitation at the church at 11:00 AM. Cremation will follow the service and interment will take place at a later date at Calvary Cemetery. In lieu of flowers, memorials may be directed to Holy Family Parish, St. Vincent de Paul, Southern Care Hospice Services, or the charity of one’s choice. The family wishes to thank Adelaide Place, Southern Care Hospice Services, and Harbor Haven Rehabilitation Center for their loving care to Edmund. To send flowers or a remembrance gift to the family of Edmund A. Mikalofsky, please visit our Tribute Store. Guaranteed delivery before Edmund's visitation begins. Guaranteed delivery before Edmund's funeral service begins. "Email Address" would like to share the life celebration of Edmund A. Mikalofsky. Click on the "link" to go to share a favorite memory or leave a condolence message for the family.